It’s almost March, and if you’re a school-based SLP, you know that means high stakes standardized testing. I work on listening and reading comprehension all year long in my Speech Room. It’s one of the biggest educational impacts I see for students with language impairments and it’s always a hot topic in March! During reading comprehension activities, children need to synthesize skills for vocabulary, WH questions, comparing & contrasting, inferencing, recall, and the list goes on! Today I’m reviewing, Reading Comprehension Camp, the newest app released this week from Smarty Ears. 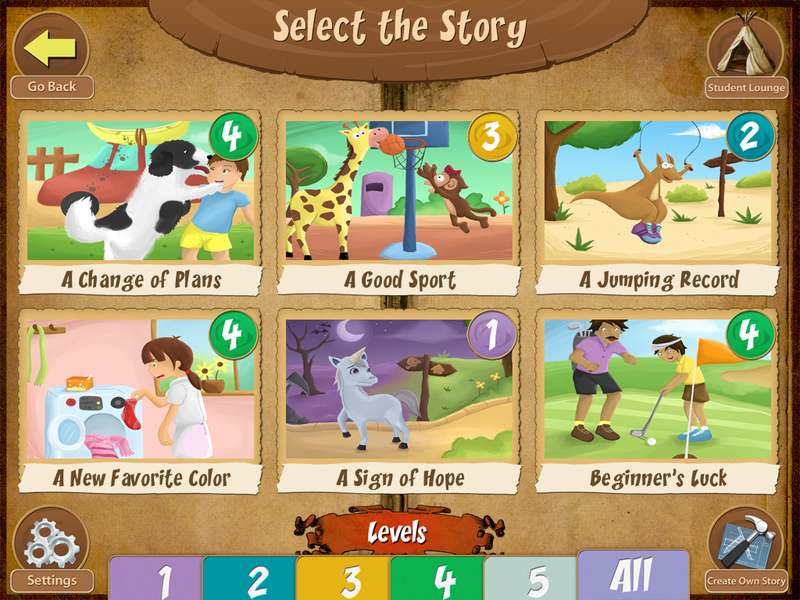 Reading Comprehension Camp is an app that features 50 stories with accompanying reading comprehension questions. Smarty Ears indicates that the levels are coordinated with Flesch-Kincaid readability levels. In the RC Camp app, level 1 is appropriate for 2nd/3rd grade readers and level 5 is appropriate for grades 6/7. Add your students, and then select up to 4 profiles to record data on during each session. 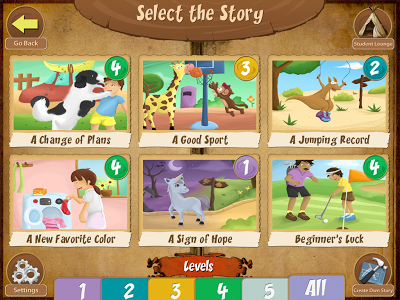 Select a story based on reading level. The story settings can adjust the size of picture font. This level 1 story is just one paragraph. The story length increases as the difficulty level increases. When you’re ready to complete a story quiz, touch the quiz button. Next you will be able to select the types of questions to include (11 options). One of each of these questions will be included. Settings for the quiz include the number of answers, the format for wrong answers, hints and more. The quiz page allows the SLP to determine whether the student sees just the image, just the text or both (see the bottom right buttons). Students view the question and answer choices (I selected 4 choices). Students select the answer, which fills the diamond next to that response purple. Select ‘check’ to see if the answer is correct. Correct answers will show a green check. The hint button highlights the related text yellow. A great way to help students determine if they are I chose the ‘mark through wrong answers’ option. I like to encourage this skill for test taking and it gives us the opportunity to see it on the iPad! Here’s a view without the text and without the picture! Data collection is available by question type and easily shared via print/email or imported into the Therapy Report Center. But wait, there’s more! ((no ShamWows for sale here)) 10 stories at each of the 5 levels sounds pretty great. What makes it worth even more is that the app allows for expansion. RC Camp has a feature to create your own stories. This allows you to personalize stories to students, let students develop their own stories to ‘publish’ and increase the passages you have available to treat your students. 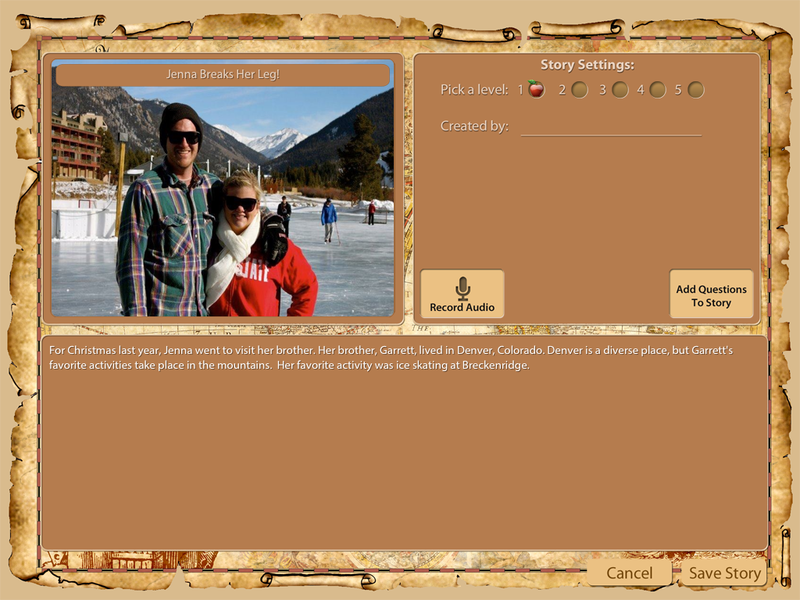 To create your own story, start on the story selection page. 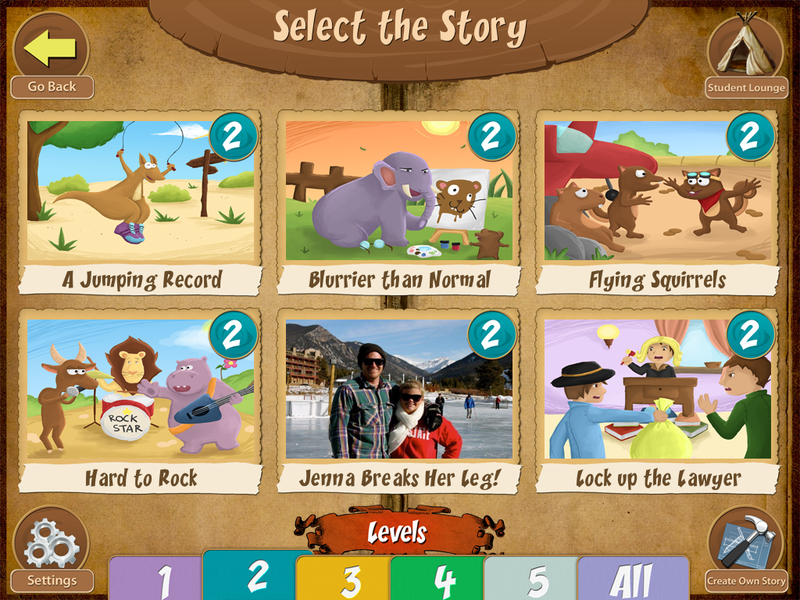 In the bottom right corner you will see the ‘create own story’ icon. 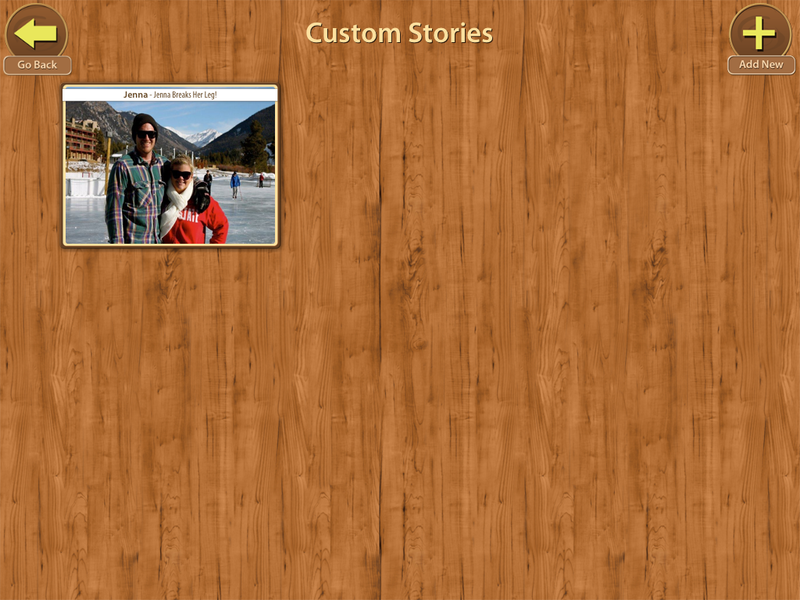 Upload a photo and type your story. Select the readibility level. Then record yourself reading the story. Create questions for each of the 11 types for stories. 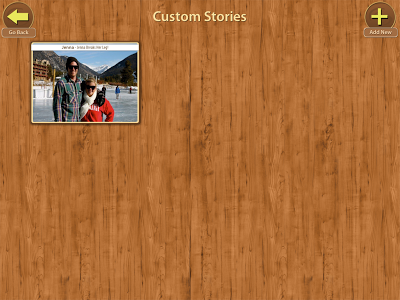 When you save the story you will find it in your Custom Stories. It will also be in the stories available by level! So what’s the bottom line? Pros: Reading skills are directly impacted in children with language impairments. RC Camp targets comprehension of fiction texts at a variety of levels. The variety of question types allows me to work on the same story with multiple students and varying skills levels. I love the hint button, which gives the student the choice to find the context clues. Over all, the app is well thought out and developed to fill a need in the market. Cons: I wish that there were nonfiction stories included. I would also love it if the reports indicated whether the student required the use of the ‘hint’ button to answer. I don’t want to turn off the hint button, but that information included in the report center would help me indicate the cueing levels needed. Reading Comprehension Camp is available from apple and is currently listed at $19.99. Disclosure Statement: I was provided with copy of Reading Comprehension Camp for the use of app review. No other compensation was provided. I was actually excited about this app before reading this but it is way too high for my Kindergarten kiddos. Yes, it’s definitely meant for 2nd grade and up! Thanks for the review! This looks great! Do you need to be a teacher to fully utilize the app?